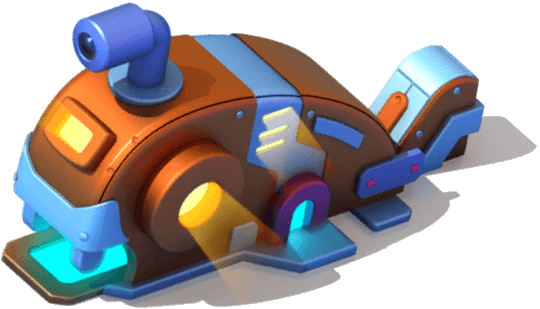 The major new feature added in Update 1.3, Clockwork Dungeon, is a structure found on the Campaign Map which provides a group of quests that changes every day. 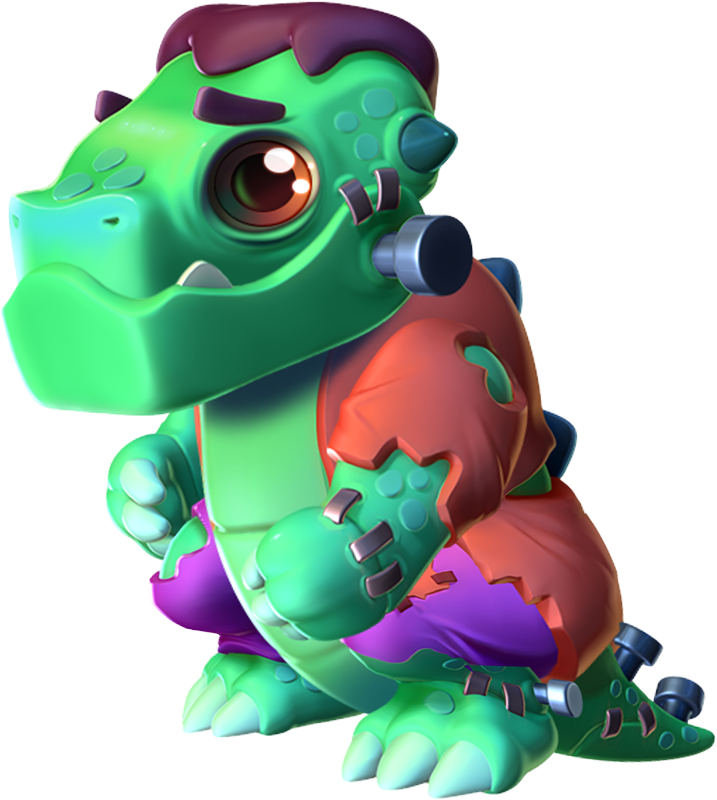 Unlike regular Campaign Map quests, each quest in the Clockwork Dungeon contains two groups of 3 Dragons to fight. It appears as a submarine in the middle of the first three campaign islands and can be accessed through the button on the bottom left-hand corner of the Campaign Map screen. It can first be played after reaching Level 16. Each iteration of the Clockwork Dungeon consists of 6 quests. Unlike normal quests which require Portal Energy, Dungeon Quests require stamina to participate in. 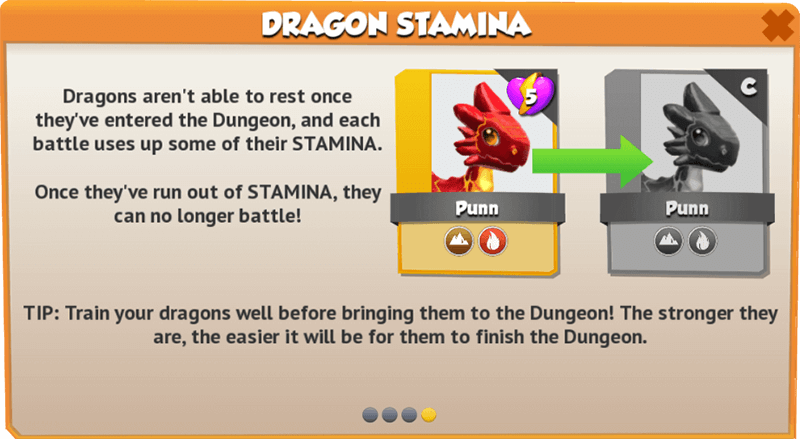 Stamina is separate for each individual Dragon and is automatically refreshed on the next iteration of the Clockwork Dungeon. 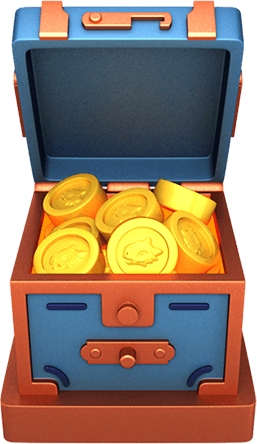 Once a Dungeon Quest is completed, the Trainer obtains Dungeon Tokens, which can be used in the Dungeon Shop. Completing an iteration of the Clockwork Dungeon allows a Trainer to choose one of the three chests which can contain a Dungeon Dragon. 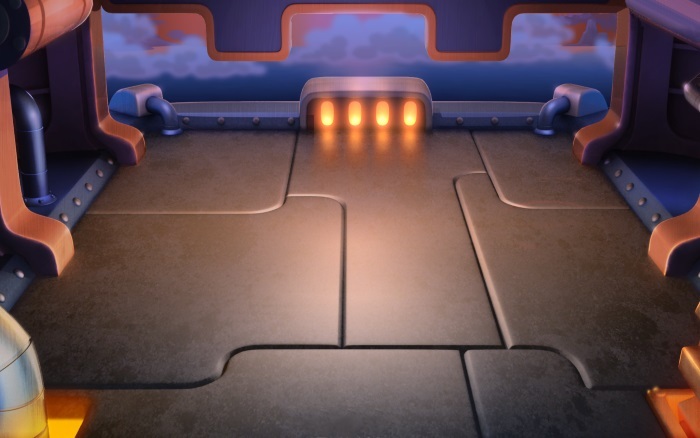 The Dungeon resets daily at 05:00 UTC. 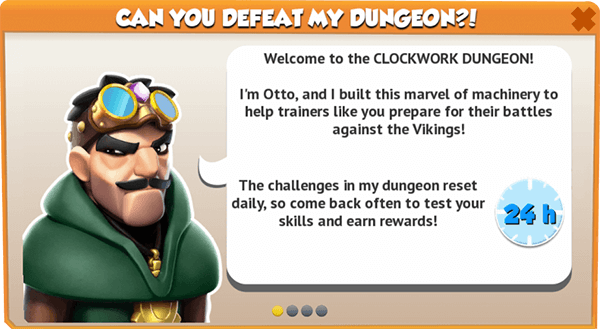 The Clockwork Dungeon is run and owned by Otto the Dungeon Master. 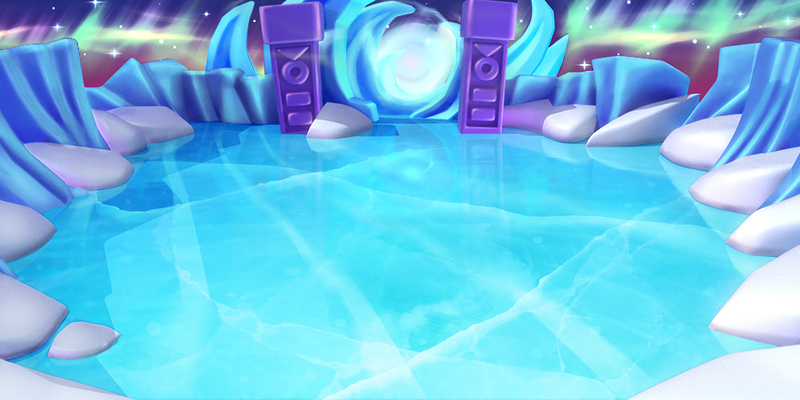 Pressing the button on the Campaign Map will take the Trainer to the submarine and will bring up a window that shows the currently-available Dragon and the option to view its Codex entry, the rounded time left until the Dungeon resets, (if specified) the base Elements of the opposing Dragons, and the button used to enter the Dungeon. 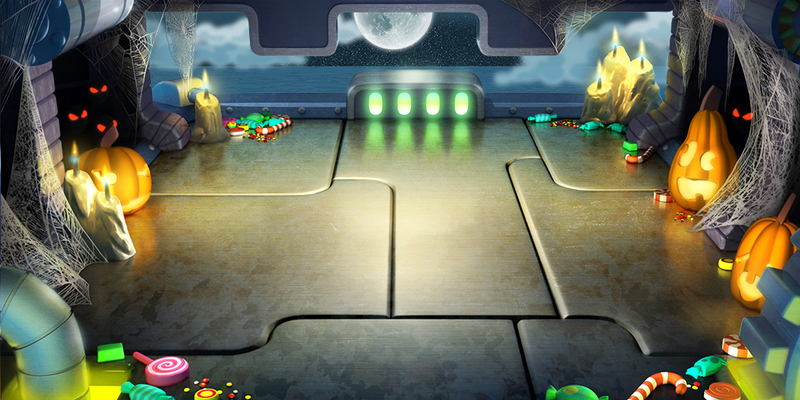 Once inside it, the exact amount of time (only the longest two units of time) left until the Dungeon resets is shown at the top of the screen, the current amount of Dungeon Tokens the Trainer has is shown in the top-left corner and the button underneath it for purchasing the Dungeon Token Multiplier, the currently-available Dragon in the bottom-left corner and a small button in its left used for viewing its Codex entry, a big option in the top-right corner used for viewing general information about the Clockwork Dungeon, the button in the bottom-left corner used for accessing the Dungeon Shop, and the six quests and their numbers spread across the Dungeon. 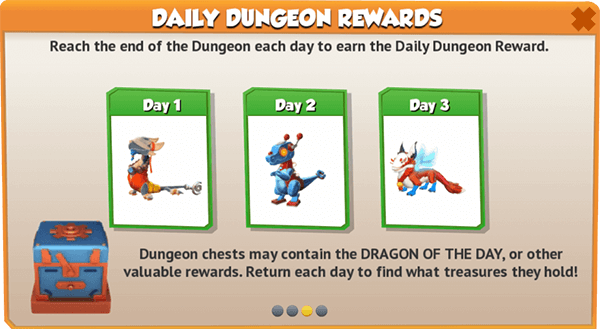 There are six Dungeon Quests that are available to complete per day, each rewarding a number of Dungeon Tokens, each representing a different area of the Dungeon. The higher the quest, the more Dungeon Tokens received. Quests will have one of three different colours depending on their availability. The quest that can be currently battled is colored in yellow , quests that can not yet be battled are colored in gray , and quests that have been defeated are colored in red . All quests, regardless of color, have a white skull on them. 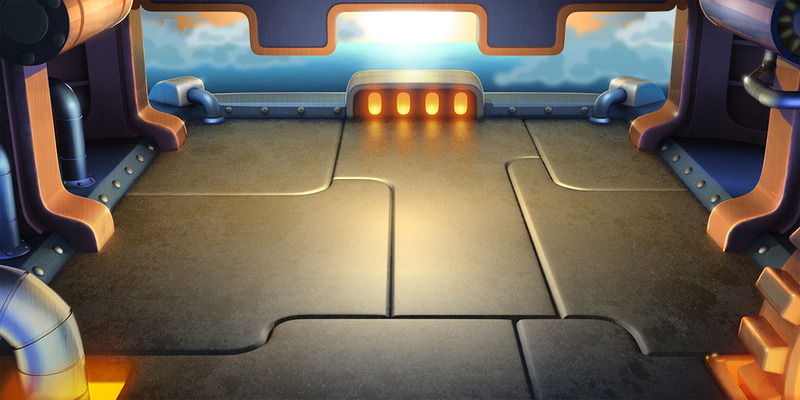 The heart of the dungeon, this enormous furnace must be fed with a steady supply of fuel to power all its machinery. This room is full of gears of all sizes turning round and round to run the intricate machinery of the dungeon. Every good dungeon has cells, but these are just being used for spare parts. This room is packed with strange electrical equipment that blinks and buzzes. 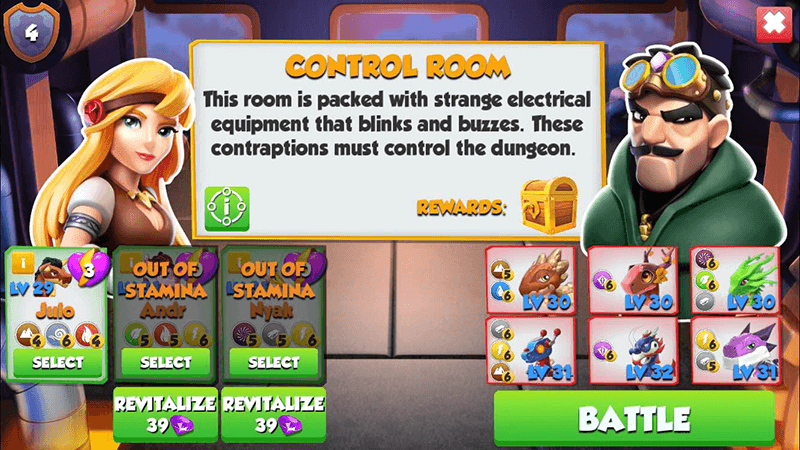 These contraptions must control the dungeon. Compared to the rest of the dungeon, this long corridor is surprisingly well-lit. Where could it go? The walls of this study are covered in pages of Otto's designs for the Clockwork Dungeon. In order to participate in a Dungeon Quest, a Dragon must have at least one stamina. 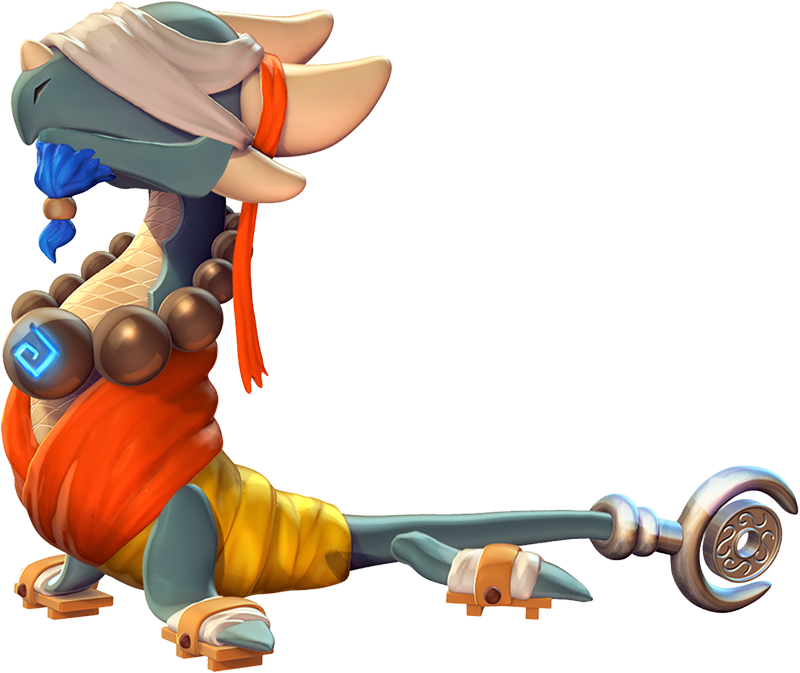 At the beginning of every day, each Dragon that is able to battle has three stamina. 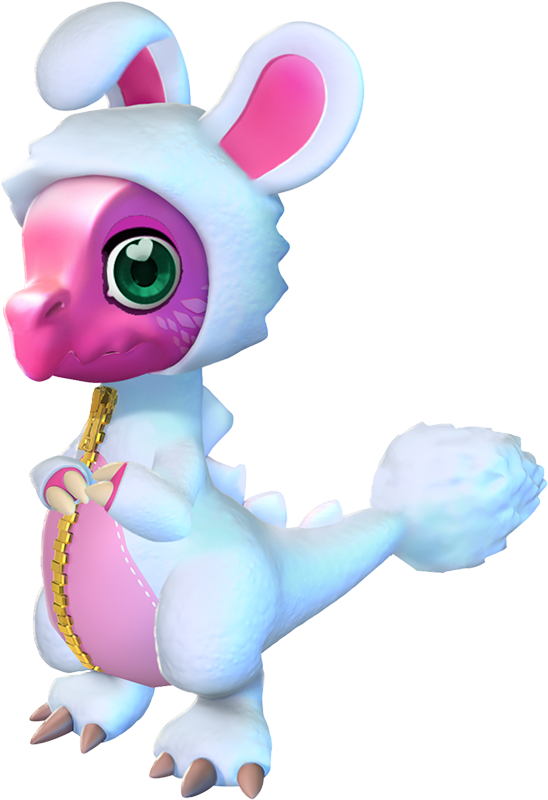 Participating in a Dungeon Quest reduces a Dragon's stamina by one. Once a Dragon's stamina has been reduced to zero, it can no longer participate in Dungeon Quests for the rest of the day. Trainers can use Gems to restore a Dragon's stamina. 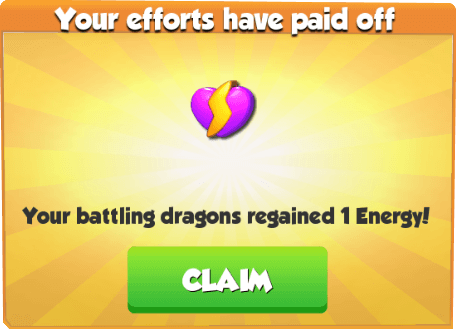 Each stamina requires 13 Gems to refresh, and can only be restored to maximum, after a Dragon has run out of stamina, for a total of 39 Gems by pressing the button. Stamina can also be restored if the Trainer is given a video to watch. There is a pre-set number of how many times videos are offered on a day, which can vary, thus the Trainer might not even receive the option to restore the Dragon's stamina via watching videos. If videos are available to watch, the button will be shown under the snapshot of the Trainer's Dragons in the pre-battle screen of the next quest only if there is at least one Dragon that has under three stamina. Pressing it and watching the video will restore the stamina of all Dragons (even those who still have one or two stamina left) by one. Once entered, Trainers commence in a wave battle. During a wave battle, Trainers must defeat two sets of three different Dragons. Once the entire first wave of Dragons is defeated a second wave appears. The Dungeon Quest is only won after defeating the second wave. The power and levels of the opposing Dragons are based on the mean average of the top six Dragons of the Trainer. 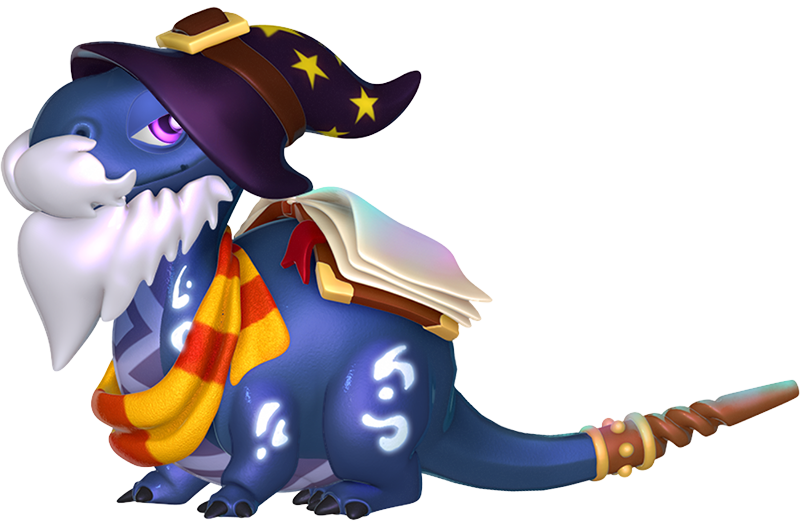 The levels and Enchantment Levels of the opposing Dragons depend on the Trainer's Dragons' own level and Enchantment Level. The six strongest Dragons of the Trainer are taken into account when determining the levels of the enemy Dragons. If the Trainer sells any of these Dragons, the level of the opposition will adjust accordingly starting with the next Dungeon iteration. Completing a Dungeon Quest rewards a Trainer with Food, Gold and Dungeon Tokens. Each quest has a set base amount of Gold and Food which depends on a multiplier that scales in accordance to the Trainer's level. After the modifier is applied, the final number is rounded to one that is dividable by 500. Thus, while the actual Food reward given to a Level 59 or higher Trainer for defeating the second quest is 5,250, the amount is rounded to 5,500. The amount given of these two resources is increased by 50% if the VIP Status is active. The amount of Dungeon Tokens rewarded can range from 20 to 200. 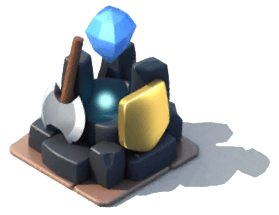 This can be increased only if the Trainer chooses to activate the Dungeon Token Multiplier, a feature that doubles the Tokens earned from quests. There are no stars or scores rewarded for completing a Dungeon Quest. 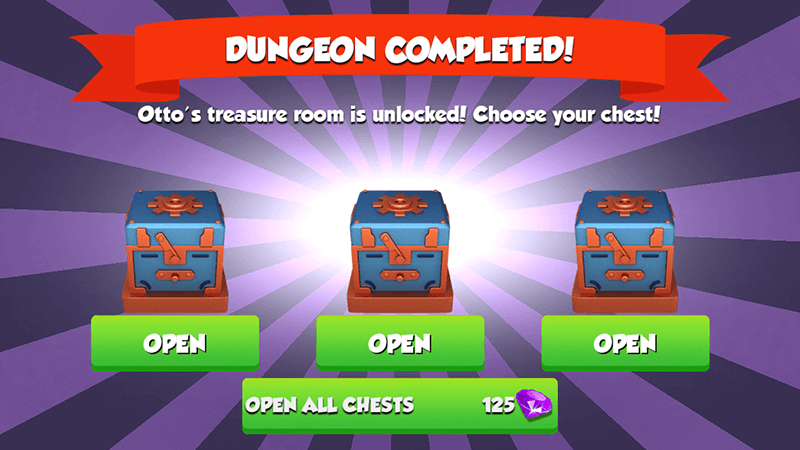 Completing an iteration of the Clockwork Dungeon allows the Trainer to open only one of the three treasure chests through the option under the chest they prefer. However, in exchange for 125 Gems, the Trainer can open all three chests through the option. 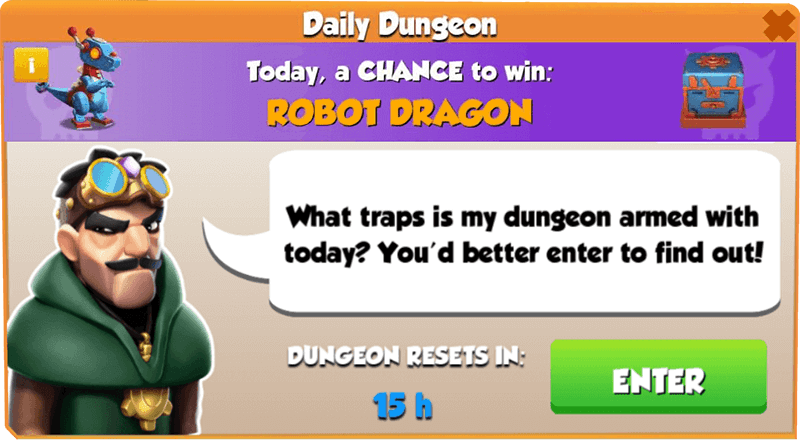 Each chest has a chance of containing Food, Gold, Gems, Scrolls, Dungeon Tokens, or the Dungeon Dragon of the Day. There is a 3% chance that a Dragon will be rewarded. VIP Status and the Dungeon Token Multiplier have no effect upon the prizes in the chest. The amount of Food and Gold rewarded depends on the Level Modifier. 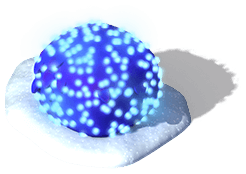 The amount of Gold rewarded can range from 44,400 to 870,000 while the amount of Food rewarded can range from 3,650 to 78,000. 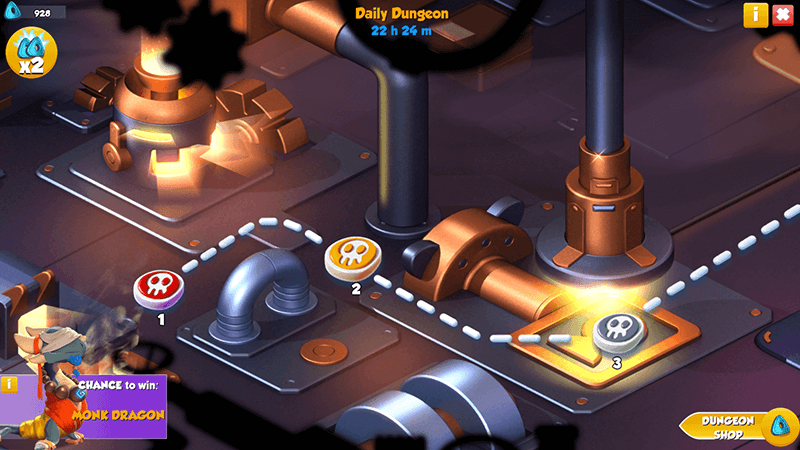 The amount of Dungeon Tokens rewarded can range from 444 to 653. 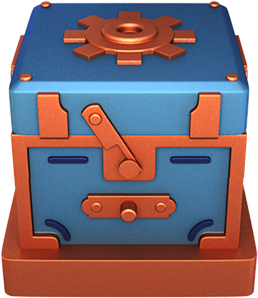 There is no guarantee that any of the three chests will contain any of those items. Completed Dungeon Quests can not be replayed until the following reset. Completing all Dungeon Quests prevents the Trainer from visiting the Dungeon until the next iteration. The Dungeon Shop will still be accessible. Mondays Zombie Dragon Wind and Metal I've armed my dungeon against METAL and WIND attacks. Show me your battle strategy isn't all just hot air! Tuesdays Monk Dragon Earth and Plant I've armed my dungeon against EARTH and PLANT attacks. Show me you can flourish even in barren soil! 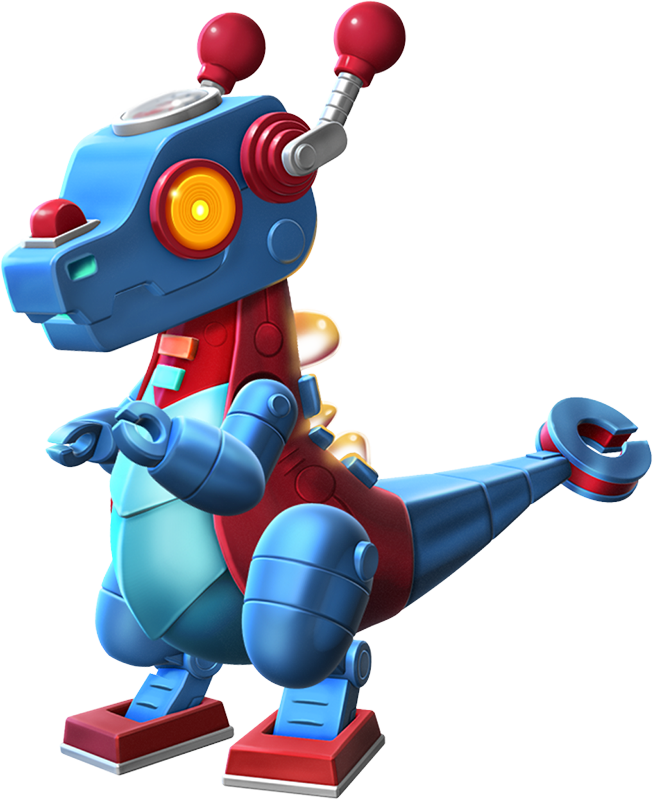 Wednesdays Robot Dragon Non-Specific What traps is my dungeon armed with today? You'd better enter to find out! Fridays Kitsune Dragon Water and Void I've armed my dungeon against WATER and VOID attacks. Show me you've got what it takes to fill their void! Saturdays Fire and Energy I've armed my dungeon against FIRE and ENERGY attacks. Show me you haven't lost your battle spark without them! Sundays Non-Specific What traps is my dungeon armed with today? You'd better enter to find out! 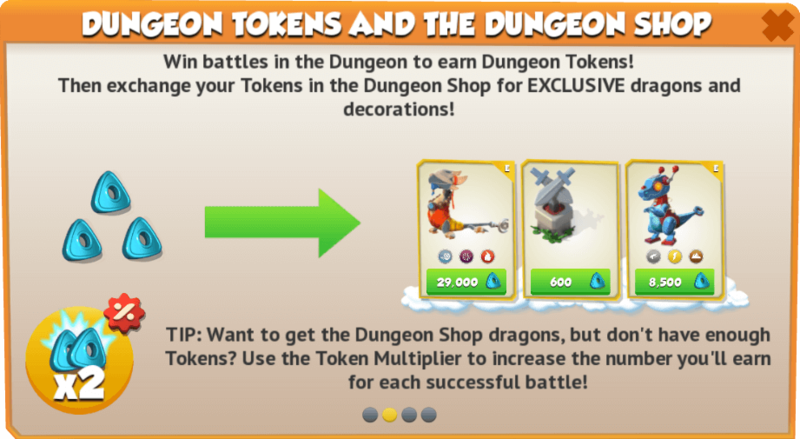 The Dungeon Shop contains both Dragons and decorations that can be purchased only with Dungeon Tokens. Regular Dungeon Dragons can only be bought after their highest Element has been unlocked. 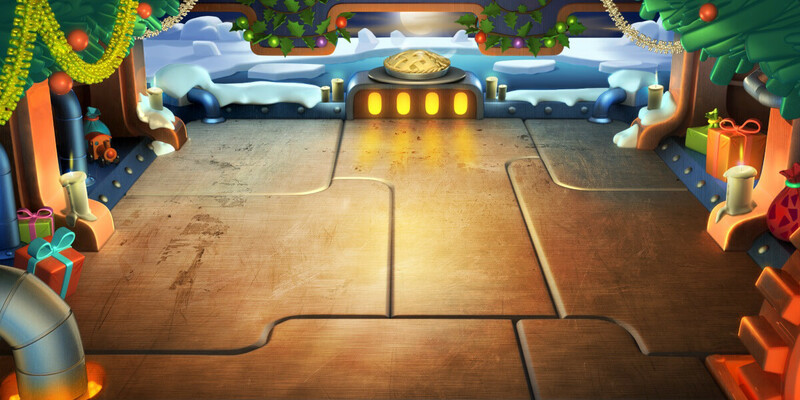 Seasonal Events are limited-time instances of the Clockwork Dungeon that occur at during a widely-held celebratory holiday. 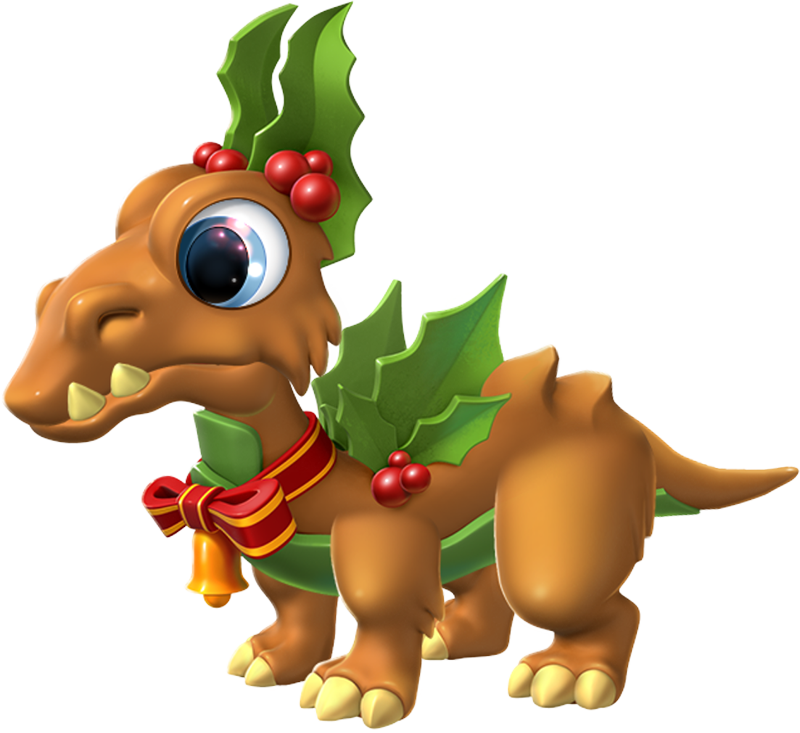 During these festivals, Trainers are provided with a unique schedule, Limited-Time Dragon, enemy Dragon rotation, and sometimes a unique battle background. 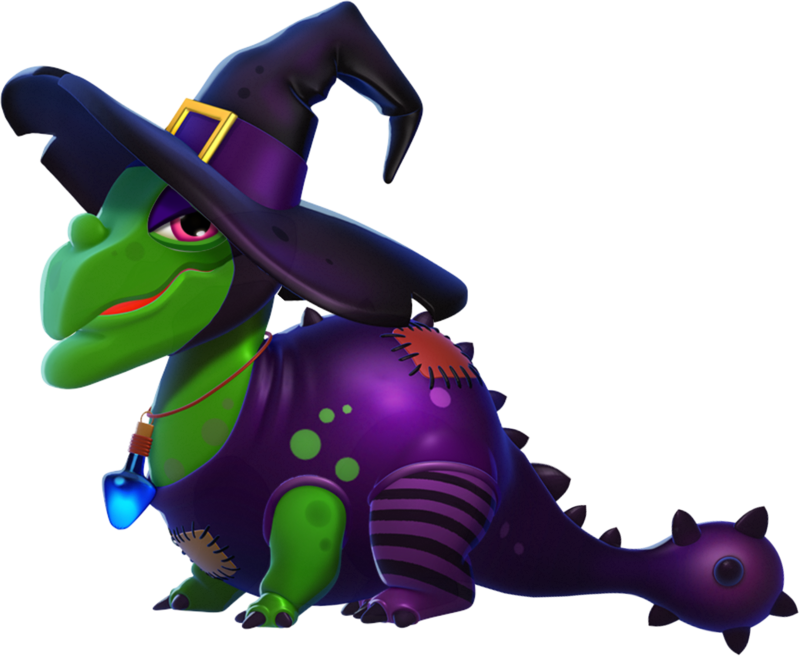 For the entire duration of the event, the offered limited Dragon becomes the only Dragon available to be won from Dungeon Chests. 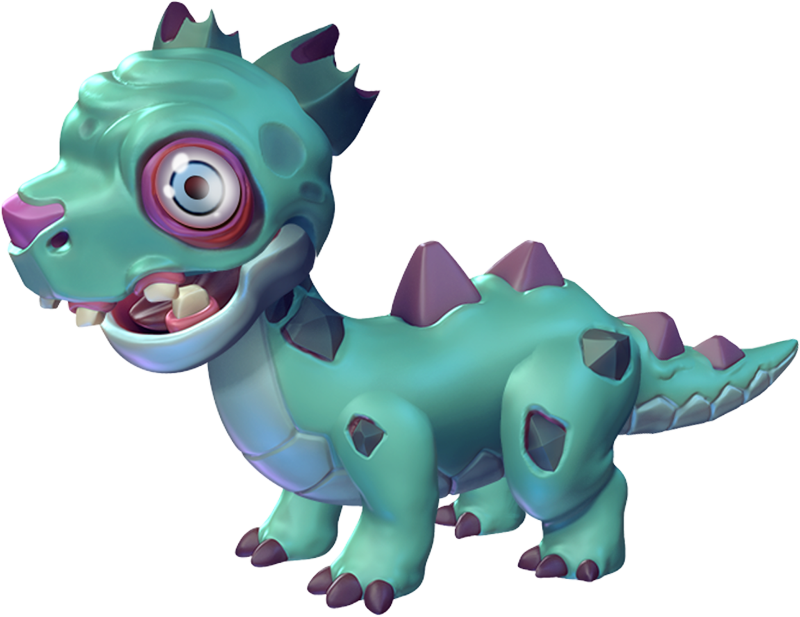 Update 3.6 introduced Enchantment Levels for enemy Dragons. 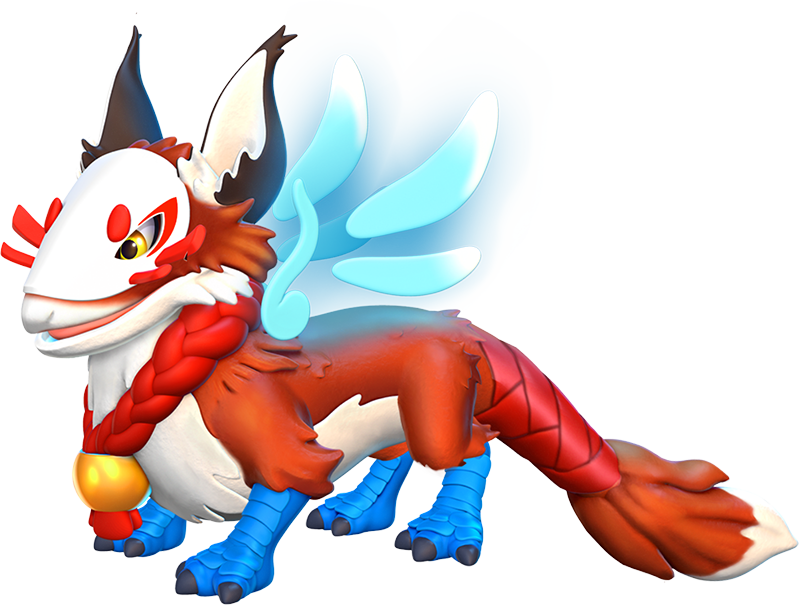 Starting with this update, the quests are no longer divided into three quests with lower-leveled Dragons and three with higher-leveled Dragons, but now the strength of the opposing Dragons in all quests is based on the mean average of the top six Dragons of the Trainer. Update 3.2 made the Clockwork Dungeon to be unlocked when the Trainer reaches Level 16 instead of beating Quest 44 (The Bob) in Normal Mode. Additionally, the option was discontinued. Update 3.0 replaced the button with the button. 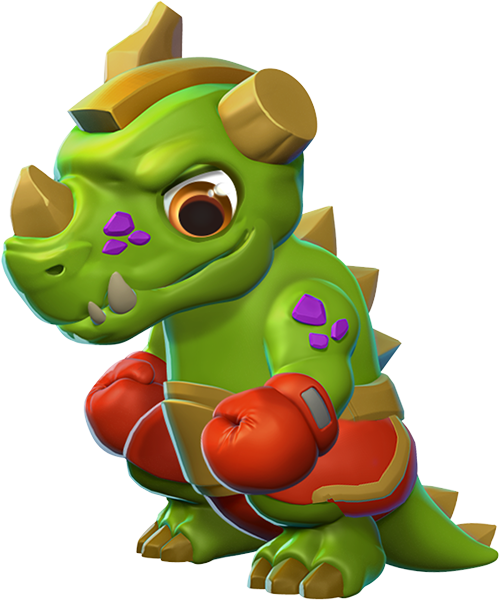 Update 2.8 discontinued pop-up windows offering videos, as well as videos for extra Dungeon Tokens, but videos for restoring the stamina of Dragons can still be watched through the newly-introduced option while videos to earn additional rewards can be watched after every battle won through the newly-introduced option. 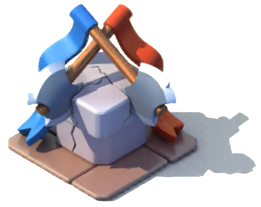 Additionally, starting with this update, making changes to the team while in the Dungeon will not affect any team used for battles outside of it. Update 2.7 introduced pop-up windows that offer videos to watch in exchange for restoring the stamina of Dragons or for obtaining extra Dungeon Tokens. 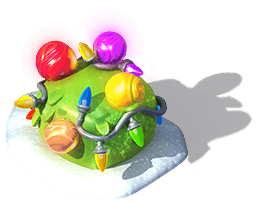 Update 1.8 introduced new decorations to the Dungeon Shop called Twinkling Shrub and Ornamented Shrub. 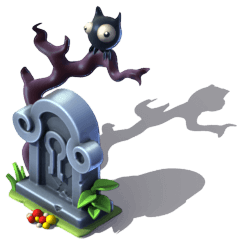 Update 1.7 introduced a new decoration to the Dungeon Shop called Whoo's Tombstone. Update 1.5 added underneath each quest their number and also introduced the Dungeon Token Multiplier. 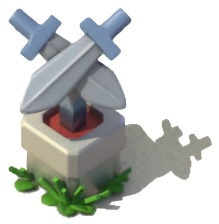 Update 1.4 changed the quest icons from to . This page was last edited on 5 March 2019, at 15:27.